Upon the recent retirement of a long-time senator, the Senate Office Buildings Painting and Refinishing Branch is set to work on one of the oldest desks in the Senate office buildings. Perched on a large dolly like an elephant on training wheels, the 1909 flat-top desk awaited its treatment, which, according to Leader Vince Lusi, could take as long as 10 days. The desk is a partner desk with drawers, cabinets and kneeholes on each side so that a senator and a secretary could be seated and work across from one another. The first step in the desk's refurbishment is to remove the finish and then make repairs such as treating gouges or scratches. The refinishers next perform a three-stage sanding process, using different grades of sandpaper. The work is tedious and could take hours – or days – depending on how badly damaged the desk is. The mahogany desk will then be carefully stained to enhance the rich veneer and original color. "It's a big deal when a historic desk comes in," said Wayne Beaton, Painter/Refinisher, as he admired the desk. "You don’t see it all the time. The wood, the detailing, the old mahogany – it's really pretty." The staff in the refinishing shop are versatile – every man can perform any of the steps in the process. Their new shop on the fourth floor of the GPO Building B, where they've been since 2013, is airy and light filled. There is plenty of room to maneuver large furniture like the partner desk, which according to Senate Curator Melinda Smith, used to be called a "battleship desk." When an older piece like the 1909 desk comes in, the refinishers take special pride in making it look good. "It's interesting and fun – especially the historic pieces," says Beaton, who has been with the Architect of the Capitol (AOC) since 1990. Added Lusi, "We take a lot of pride in making it look like it's never been damaged or worn down." In 2008, in preparation for the 100-year anniversary of the opening of the Russell Senate Office Building, the Senate Curator's office conducted extensive research on the history of the furnishings. The office located an original dark green leather sample from the AOC Records Management and Archives, as well as the original formula for products to be used on refinishing the desks. "This discovery now allows us to return these furnishings to their original 1909 look with dark green leather," said Smith. Dark green leather is now available as an upholstery option for historic Senate furniture. Flat-top desks were custom-made to furnish the Russell Building when it was first occupied in 1909. New York cabinetmaker Thomas D. Wadelton was hired to manufacture full-scale models of the furniture under the direction of the architectural firm of Carrere & Hastings, which designed the building. Following an in-depth review process, George W. Cobb, Jr. was awarded the furniture contract on August 6, 1908. Cobb submitted the lowest bid at $61,715.70, which at the time was the largest single furniture contract issued by the Senate. When the Russell Building officially opened on Friday, March 5, 1909, 92 sets of mahogany furniture – including the desk in the refinishing shop – had been delivered for use by each of the senators from the nation's 46 states. The staff at the Senate Office Buildings Upholstery Branch sees mostly chairs and couches (davenports). 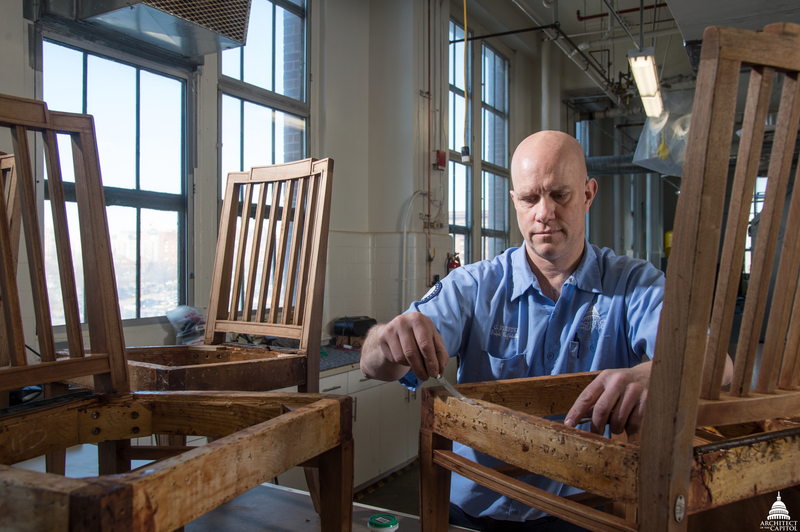 "Everything we do is pretty much by hand," said Upholsterer Danny Kreitman. "Even our modern tools are 100 years old – things like clamps – we use them because they work." When a chair arrives at the upholstery shop, the staff tightens the springs, which could take a day or a week, depending on its size. Sometimes the chair needs new webbing or new upholstery. The original Russell chairs are stuffed by hand with combed horsehair. Others are stuffed with foam and cotton. The shop sometimes won't see a piece of furniture for 50 years. "A nice leather sofa can go from senator to senator without ever being recovered because they are so durable," said Kreitman. It's clear that the refinishers and the upholsterers take a lot of satisfaction in their work, especially when it comes to working with a piece of history. "It is a privilege to work here," said Lusi. "How could you not be proud?" 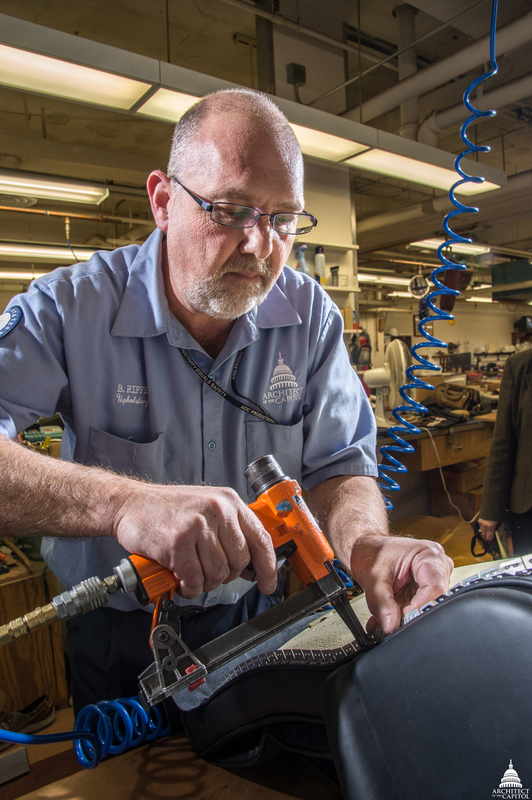 Upholsterer Ben Riffe refurbishes a senator's high-backed desk chair. Painter/Refinisher Wayne Beaton applies sealer to a Senate office chair. 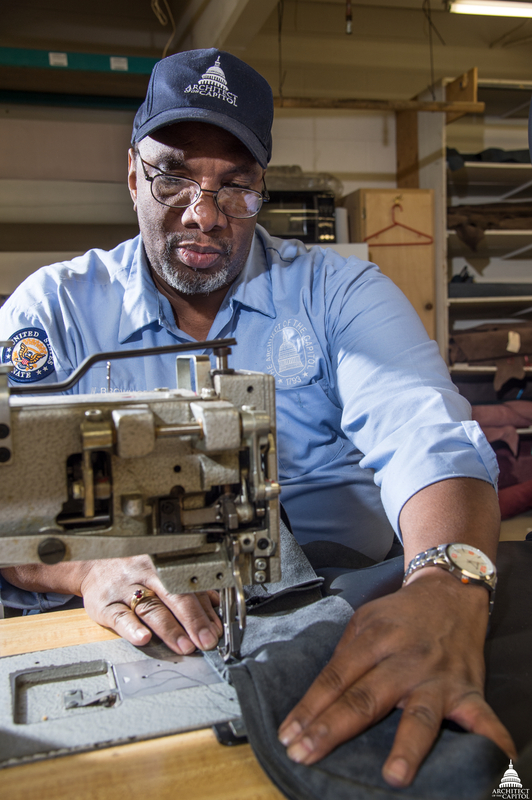 Upholsterer Willie Brown, who has worked on Capitol Hill for 34 years, sews a chair cushion. 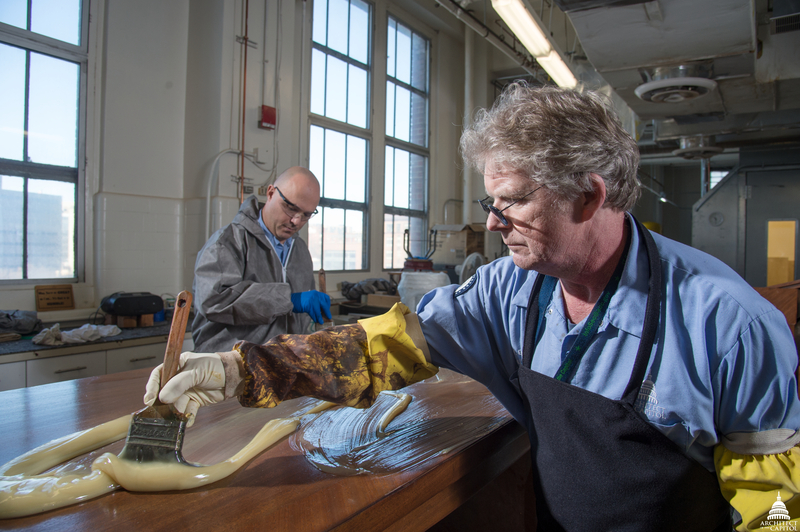 Leader Vince Lusi and Painter/Refinisher Wayne Beaton apply a stripping agent to a flat-top desk, custom-made to furnish the Russell Senate Office Building in 1909. 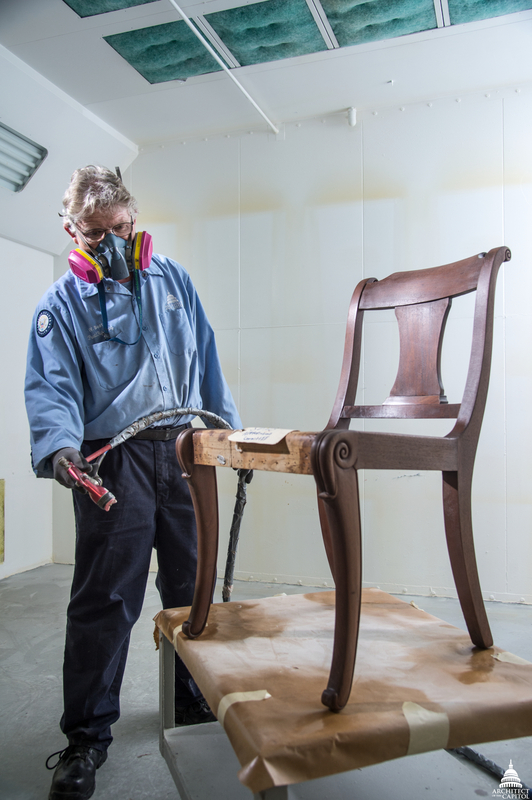 Painter/Refinisher Oliver Pluntke prepares a Senate office chair for refinishing. We are so fortunate to have so many highly skilled craftsmen and women working in the Capitol. Kudos to you for telling the stories of their contributions. I always feels amazing when I see an old furniture can be made into a new look like it is really new made and finished. Because it is more go green and environmentally friendly. Good job for Ben Riffe, Wayne Beaton, Willie Brown, Vince Lusi, Oliver Pluntke ! !